“In spite of several challenges in the health sector in India, our vision is to provide universal health coverage i.e. ensure universal access to quality healthcare that they need without financial hardship for our citizens”. This was stated by Shri J P Nadda, Union Minister for Health and Family Welfare at the 12th India Health Summit, an annual flagship event on healthcare, organized by the Confederation of Indian Industry (CII). Shri Nadda highlighted some challenges in the health sector in India such as like variation in health facilities between urban and rural areas, variation between public and private health services and issues of regulation regarding health activities. Concentration of health services in the southern and western parts of the country don’t match in terms of health delivery system as well as health infrastructure with the northern and central regions. The North-Eastern and the Central tribal areas also need attention, he added. The Health Minister said generally the focus lies on secondary and tertiary but primary healthcare also needs more attention. Paucity of human resource in health, inadequate infrastructure, poor logistics and supply chain arrangements to ensure essential drugs and supplies continue to be areas of concern, the Health Minister added. Shri Nadda said, “We need stronger partnership to achieve the target under the Sustainable Development Goals (SDGs) to ensure healthy lives and promote well being for all by 2030. The country is broadly on track to achieve the three MDGs related to the health Sector.” Enumerating the recent notable achievements of the Ministry, the Health Minister said that with “Mission Indradhanush” (which is the world’s largest immunization programme) the full immunization cover has increased to 65% while the aim is to extend this 90% by 2020. Shri Nadda stated that the National Health Mission (NHM) and Mission Indradhanush have very significantely contributed to strengthening health sector in India. Since inception, a total of over Rs. 1, 34,000 crores have been released under NHM. The Health Minister further stated that the India Newborn Action Plan (INAP) aims to will bring down newborn deaths and still births in single digit by 2030. The recently launched IPV as part of Routine Immunization Programme will also play a major role in preventing child mortality. The Health Ministry is planning to launch vaccines like for Adult JE, MR and Rotavirus soon, he added. The Health Minister informed that the Government has taken some major policy decision in its fight against HIV-AIDS. He said that in view of the growing need for treatment services, the Ministry has decided that the cut-off level for initiation of Anti Retrieval Therapy (ART) will henceforth be a CD4 count of 500. With this decision an additional 1 lakh persons will start getting benefit of treatment. 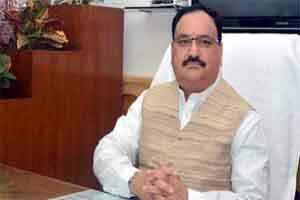 Shri Nadda invited suggestion from the private sector for the draft National Health Policy. These suggestions will enable it to become holistic and truly meaningful, he said. Also present on the occasion were, Dr. Naresh Trehan, Chairman, CII Healthcare Council and Chairman and Managing Director, Medanta-The Medicity, Shri Malvinder Mohan Singh, Executive Chairman, Fortis Healthcare Limited and Shri Rahul Khosla, Co-Chairman, CII Healthcare Council and Managing Dirctor, Max India Limited.